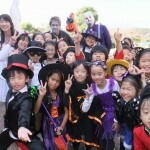 On November 28th we held our annual Halloween celebration at Gyosei International Primary School. All students came to school as regular in the morning but changed into their costumes upon arriving to school. In the regular course students had Halloween activities during the English lessons. In the International division students had Halloween activities during homeroom teacher’s lessons. The children enjoyed acting the parts of the characters they dressed up in as they sat lessons and played together during the recess breaks. This year was a lot of fun for all.